The Atlas Kasbah near Agadir in the foothills of the Anti-Atlas mountains is an Eco lodge that also offers a taste of Berber life and is surrounded by varied and beautiful Moroccan landscapes .It is high on a hill with a panoramic view of the countryside. The 11-bedroom lodge uses solar power for 80% of its energy, has solar-heated showers, a chlorine-free pool and a herb and vegetable garden. As well as views of the Atlas mountains there is the opportunity to meet the local Berber communities in the surrounding countryside. Members of the local community work at the lodge and cook traditional tagines and other dishes. The village of Tanefeest and the Atlas Kasbah lie in the Souss-Massa-Drâa region in the Unesco argan tree biosphere reserve and it is possible to visit an Argan oil factory and watch the production process. 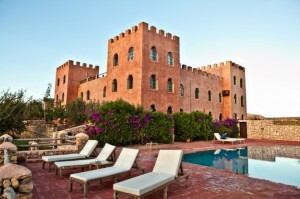 Further afield there are a number of day trips to the ancient town of Taroudant and the beaches along the coast from Agadir. 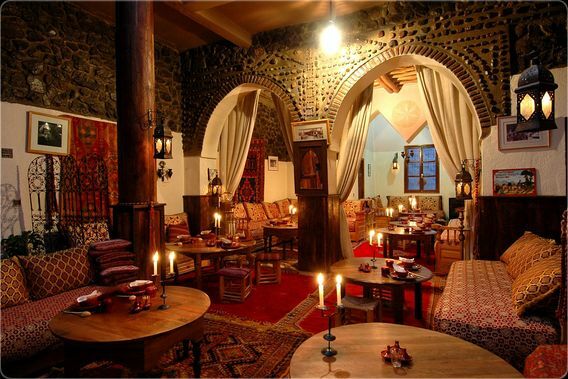 Also in the South of Morocco is Ksar Shama in the village of Ouirgane with 20 rooms in 15 acres of land. Ouirgane is close to the Atlas mountains and is a haven of peace and tranquility with many routes in the beautiful scenary which allows trekkers to wander amongst the local communities and the Toubkal National Park. The Eco Lodge dar Itrane at Douar Imelghas two hours drive from Azilal and four hours from Marrakech in the heart of the of the beautiful Ait Bougmez valley in the High Atlas mountains.Dar Itrane is a 17-room-cultural ecolodge dedicated to the promotion and protection of the Berber Culture in the High Atlas of Morocco at an altitude of 1850m/6000 ft, close to the MGoun Mountains Range.The lodge is traditionally built and blends with the local houses of the Bougmez valleyand has a library dedicated to Berber culture. It is an environment friendly building with waste management and water consumption management. At an altitude of 1,800m (6,000 feet), Dar Itrane and the Bougmez Valley enjoy a fine climate, allowing journeys almost all year round. There is a traditional Hammam and comfortable living rooms, patios, and roof terraces offering a excellent views over the valley. 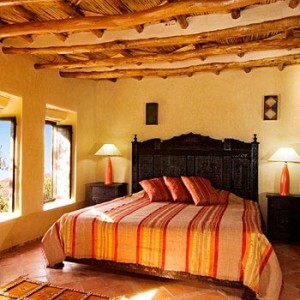 Going further south there are a number of Eco lodges in the desert and Oases. These include Oasis Bab el Oued in Agdz in the Draa Valley Palm groves witht 5 rooms at the heart of a palmgrove with a an organic orchard and a garden of aromatic and medicinal plants . Activites such as hiking, mule treks and mountain biking are on offer. Close by is Kasbah Timidarte . This is a pilot project for rural tourism located 15km from Agdz in the Draa Valley. The Kasbah has been restored with respect to local tradition to be transformed into a guesthouse. The Ksar El Khorbat, Tinejad is near the Todra Gorges It is guest house with a museum, and a workshop for craft women. it is a model of ecotourism in Morocco and is a fully restored adobe kasbah.